Although named the Beginners Marijuana Seeds Grow Set, it’s perfect for outdoor planting, guerrilla growing, and for producing the fastest harvests possible. 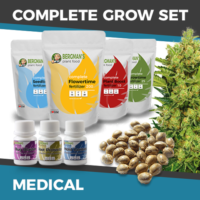 Whether your new to growing marijuana, or a seasoned veteran, the high quality autoflowering seeds contained within this set will grow, flower and be ready to harvest within approximately 56 from seedlings. We offer a selection of complete Grow Sets, each containing a different marijuana strain, with varying characteristics and suitable for various needs, tastes and preferences. Containing the highest quality seeds, feeds and protection compounds your plants may require to produce a top-class harvest. Expect the highest quality seeds, all shipped with the I Love Growing Marijuana germination guarantee, ensuring the finest, freshest seeds and the most stable strains. Each seed is completely feminized, containing no male chromosomes, ensuring each plant flowers and buds, generating the highest quality harvests. Supplied with four nutrient packs, each containing a different formula to maximize plant growth at each stage of the plants development. The complete marijuana seed grow set contains everything you need to produce a successful crop. Receive all the help and advice you may need from purchase to harvest. First-class customer care and support, quickly answers any questions or concerns you may have regarding your purchase. While the free to download Growing Marijuana Guide contains all the information you may require, from germination to harvesting and drying your buds for maximum potency and flavor. Growing a fast, high quality crop can be easy with this all-in-one complete purchase. 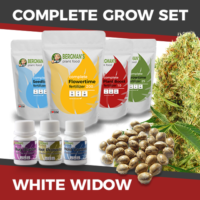 Supplied with 20 of the highest quality autoflowering White Widow seeds, all the necessary feeds, and a set of three Plant Protectors, specially designed formula’s to help keep your plants vibrant and healthy, while reducing the chances of bugs, molds or diseases damaging, or destroying your crop. You can buy the Beginners Marijuana Seeds Complete Set, containing the seeds, nutrients and plant protection needed to produce a successful crop here. Take the guesswork out of growing marijuana, with all the help, advice and assistance you may need. Requiring no set hours of darkness, and little attention to produce a fast, high quality crop, autoflowering White Widow seeds are the perfect choice for both beginners and guerrilla growers. Expect dense, squat plants with a large central cola in as little as 56 days from seedlings. Quickly growing, flowering and maturing simultaneously over its short life-cycle, White Widow autoflowering seeds produce buds indistinguishable from their standard counter-parts. Coated in resin, and with high levels of both THC and CBD, it’s the perfect choice for both recreational and medicinal growers looking for a fast, easy harvest. 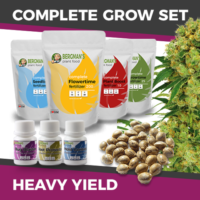 Enjoy the fastest harvests of high quality buds with the Beginners Complete Marijuana Seeds Grow Set, each set contains twenty feminized autoflowering seeds and all the nutrients and formula’s necessary to bring them to a successful harvest.